GW Silicones (Royalton, VT), which entered the liquid silicone rubber (LSR) molding business four years ago, is now completing an expansion that significantly expands its capacity. There is a heavy emphasis on close tolerance and multimaterial capabilities for the medical market in the 15,000 square foot expansion that is totally committed to LSR molding and assembly. to meet new business demands. This meant expanding our facility to match the growth of our LSR business,” says Mark Hammond, general manager of GW Silicones. There is room for 18 new iinjection modling machines in the expansion. GW is specifically targeting high-growth healthcare and medical device market applications for LSR, in areas such as cardio- and peripheral vascular, aesthetic surgery, minimally invasive and micro-surgery, in-vitro diagnostics, drug delivery, wireless monitoring, neurostimulation and neuromodulation. LSR is increasingly used in health care applications because of its combination of biocompatibility and interesting property profile. Importantly, it is resistant to bacteria, and relatively easy to sterilize. That aspect has grown in importance in the past three years since Medicare will no longer reimburse hospitals for costs incurred from hospital-acquired infections. It has a wide temperature range, is chemically resistant, and has elastomeric-like elongation properties. Like other elastomers, it is often paired with a rigid thermoplastic to combine good tactile properties with rigidity. Hammond says that LSR is a good fit with the expertise of its parent company, GW Plastics, in multimaterial molding, including, overmolding, two-shot molding and insert molding. 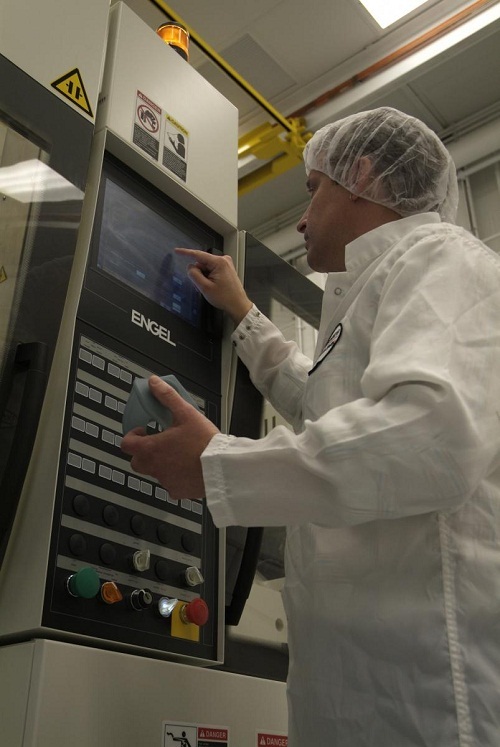 GW Plastics is installing Engel injection molding machines in the addition and other locations in an effort to standardize, so that molds can be moved from location to location. Use of the same type of machine shortens set-up times, and makes it easier to achieve consistent molding operations. GW believes that standardization of equipment across all locations is the best way to meet customer and market requirements. Molds can be moved from machine to machine, facility to facility, and within hours they can be producing precision parts. The new cleanroom will be equipped with all-electric, hybrid and hydraulic machines ranging in size from 50-200 tons of clamping force. There will be multiple screw/barrel assemblies for each press. Many of the cells in the new cleanroom will incorporate automation. A current cell at GW Silicones includes a 6-axis robot.Two of the new Engel systems being added to the expanded cleanroom will include Engel viper servo robots. Capabilities will also include in-house LSR mold design and construction.